Choose your faction, build an army and win the war in this intriguing iPhone and iPad App. Lord of the Flies taught us that children can be murderous little monsters if provoked, and while Motiga's the LeftOvers doesn't feature such violence, it works off a similar premise. Just because there are no adults doesn't mean the little ones will play nice. 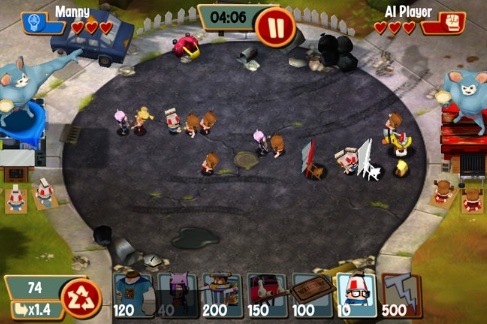 Released today for both iPhone and iPad ($1.99, universal), the LeftOvers is a real time strategy game for kids. They choose one of two factions, the nerdy D.O.R.Q.S. or Deathstrong jocks, build an army from 17 available units and then wage war, both offline and even online through a cloud based technology called MICE. We've yet to try the game, but it appears to be light hearted fun with possibly deep gameplay. We'll post a review in the coming days, but here's a link to the App Store page, in case you refuse to wait.